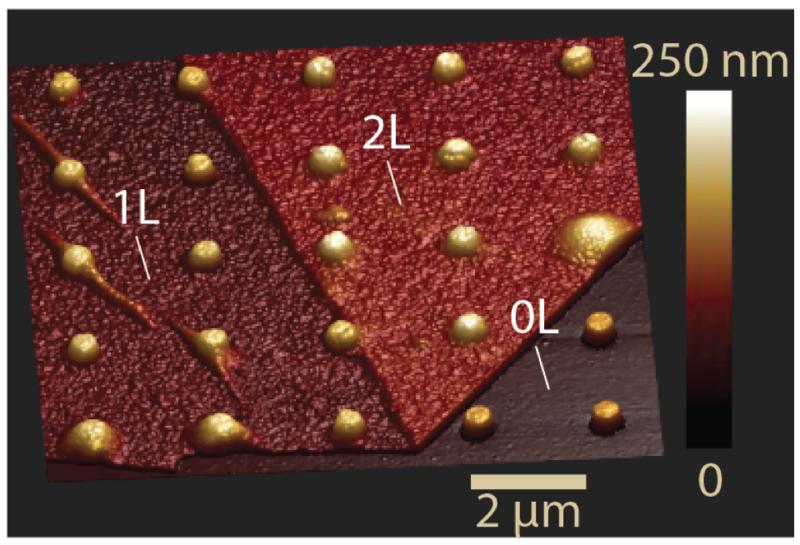 Atomic force microscopy image of an hBN thin film on a patterned substrate. In the imaged region, part of the film folds on itself (2L region). Upon optical excitation, light is selectively emitted from the pillar sites due to local activation of color centers through strain-induced charge trapping. Applications of quantum science to computing, cryptography, and imaging are on their way to becoming key next- generation technologies. Owing to the high-speed transmission and exceptional noise properties of photons, quantum photonic architectures are likely to play a central role. A long-standing hurdle, however, has been the realization of robust, device-compatible single-photon sources that can be activated and controlled on demand. Here we demon- strate large arrays of room-temperature quantum emitters in two-dimensional hexagonal boron nitride (hBN). The large energy gap inherent to this van der Waals material stabilizes the emitters at room temperature within nanoscale regions defined by substrate-induced deformation of few-atomic-layer hBN. Through the control of pillar geometry, we demonstrate an average of ∼2 emitters per site for the smallest pillars (75 nm diameter). These findings set the stage for realizing arrays of room-temperature single-photon sources through the combined control of strain and external electrostatic potentials. Previous Post08-18: Jake passes his thesis defense! Congratulations Dr. Henshaw!Next Post09-18: Nick’s paper makes it to the cover of Optica!